A good kit of this, the first US MBT circa 1945-55 . 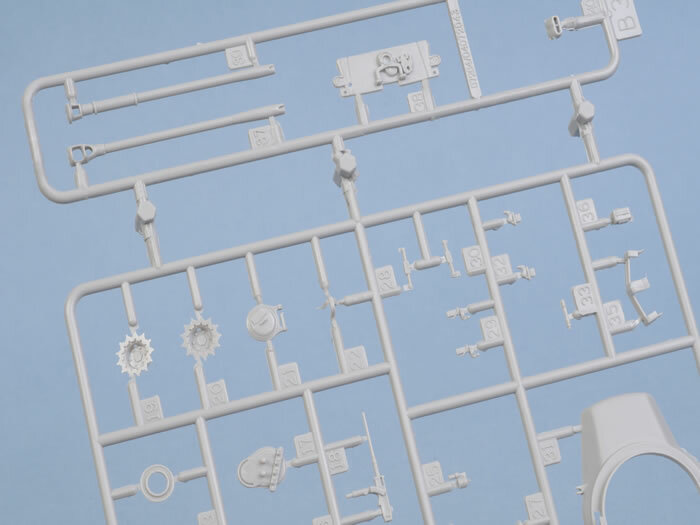 Like most of Trumpeter's 1:72 scale range offers excellent value for money and a good balance of detail vs build ability. Crisply detailed mouldings. The T26E3 Pershing was introduced to the US forces in limited numbers in early 1945 and was welcomed by the troops who finally had something to take on the German armour on more equal terms. The Pershing could have been with the troops earlier in 1944 but the decision was made rightly or wrongly to stick with the Shermans (a decision I agree with) for logistic and shipping concerns. It was a great departure from the high set Sherman and offered a good mix of heavier armour and a hard hitting M3 90 mm gun, the best and heaviest US tank gun of the war. The only real problem with it was that the Ford GAF V8 engine as fitted to the lighter M4A3 Sherman suffered due to the extra weight of the Pershing (77,000 lbs). This problem was to stay with the M26 family up until the introduction of the 810 bhp Continental engine in the M46 (a re engined and up gunned M26). The Pershing had up to 4.5” of armour in cast hull and turret and introduced Torsion Bar suspension with 23” track for US Medium/Heavy Tanks. The T26E3 was later standardised as the M26 and it served throughout the Korean War and with many NATO allies under the Military assistance program such as France and Italy. It was also redesignated as a medium tank. 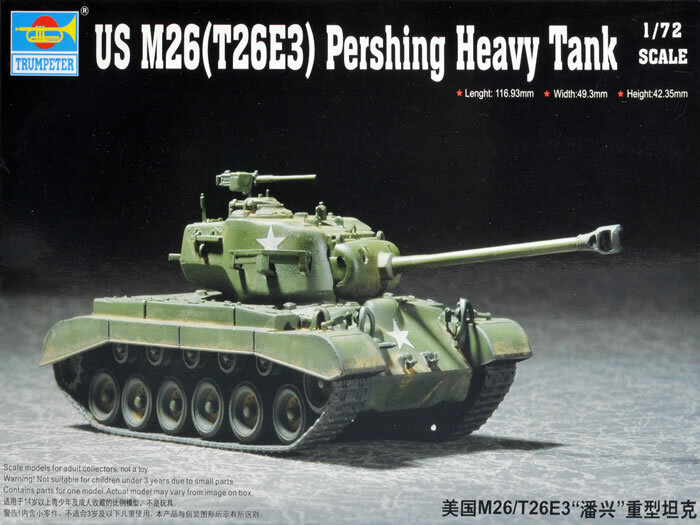 It went on to be developed into the M46 and M47 with the design lineage culminated in the M60 series of Patton tanks which served into the 1990’s. AFAIK and despite its importance, this is the first mainstream model of the Pershing in either 1:72 or 1:76 scales. The kit comes well packaged in a small sturdy box an with uninspiring built model on the top. 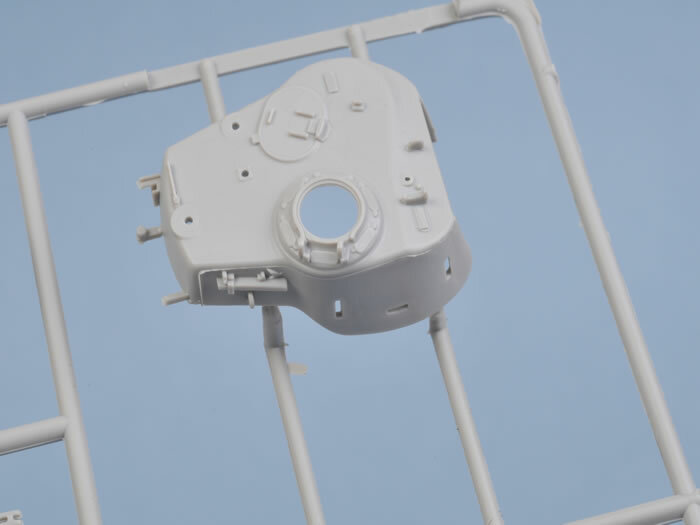 Ths kit is built on one piece upper and lower hulls, with a one-piece upper turret and detail parts enclosed in their own plastic bags with the Instruction booklet and decals. The instructions are clear, concise and follow usual Trumpeter layout with a view of sprue layout as is the norm these days. 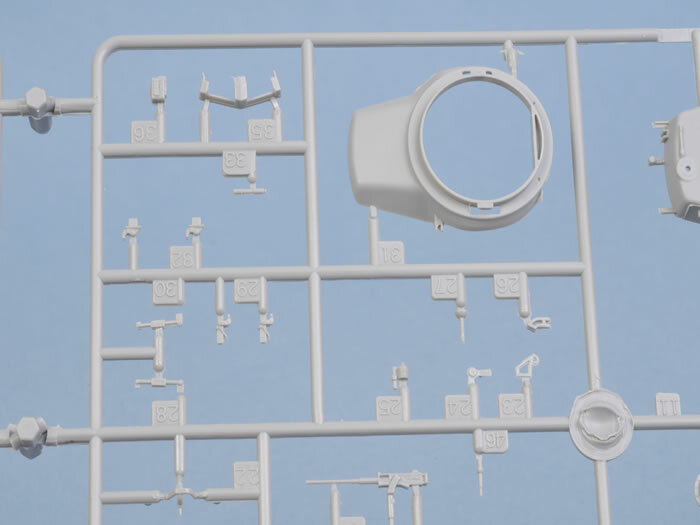 Again, Trumpeter has the build broken down into 12 Stages and I have to say the breakup of parts and engineering is clever but unlike the Abrams from Trumpeter there are a lot of smaller detail parts. Detail is restrained and in the most adequate for the scale. I found the headlight guards to be massively over scale and not very well done at all. The same can be said for the turnbuckles for the fenders. The Kit parts are in the main flash free and quite crisp with most knockouts in out of the way places (Well done Trumpeter). The lower hull is moulded as one piece but with separate positional suspension arms. Final Drive Assemblies are provided separately and the Drive Sprockets are very well detailed but on my kit the lightening holes were lightly flashed over but easily rectified with a No 11 scalpel blade. The road wheels are moulded in two parts and very well detailed for the scale. The upper and lower hulls are one piece mouldings with some detail parts supplied for the rear panel (to allow different versions to be kitted) The wide fenders are moulded integrally with the characteristic stowage bins and done well. The engine deck louvers are really well moulded but the large Panel above the radiator should not be integral to the piece between front engine access doors. This is easily fixed with a scriber but should have been spotted by Trumpeter. 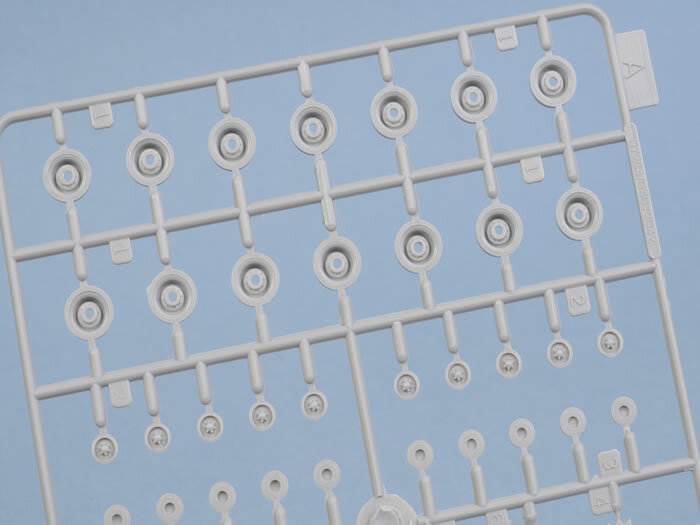 The drivers and all but the commander’s hatches are in typical Trumpeter Braille scale fashion moulded shut. The tracks are vinyl and pliable with good detail on both the outer and inner face. 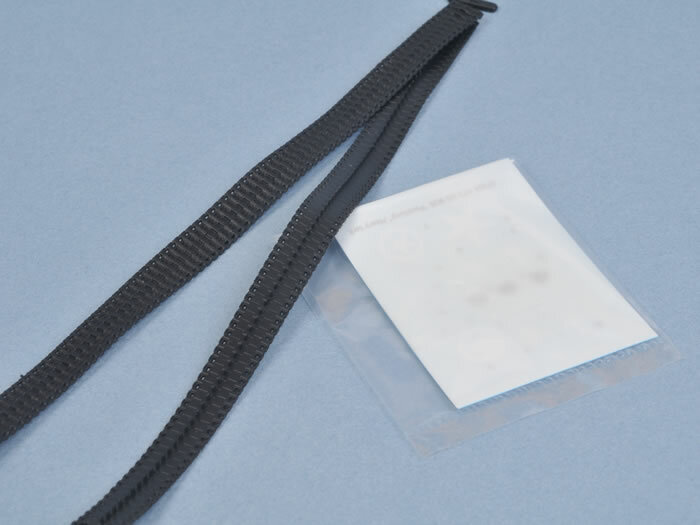 They represent the T81 single pin style of track typical of most of the Zebra Mission T 26E3 that saw service in WW2. These tracks were also seen on Vehicles that served in Korea. 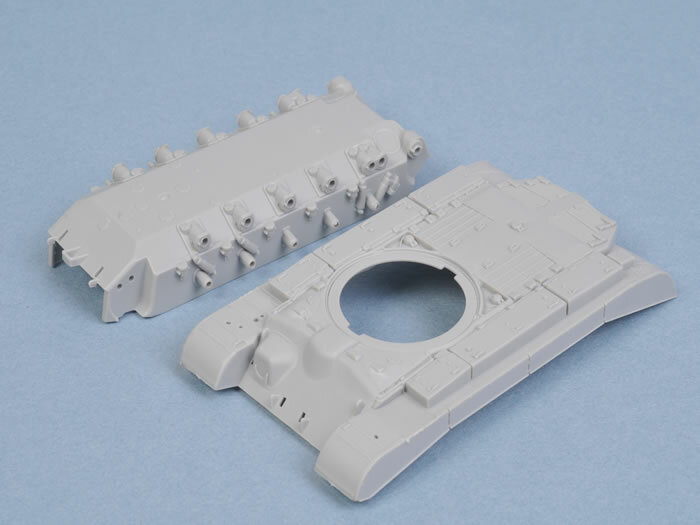 The turret has a lot of the detail parts moulded on but has some detail parts such as the engine lift attachment points as separate pieces. The lifting rings are moulded as a solid piece and not a ring, this is repeated on the hull and these are better replaced by self made wire ones. 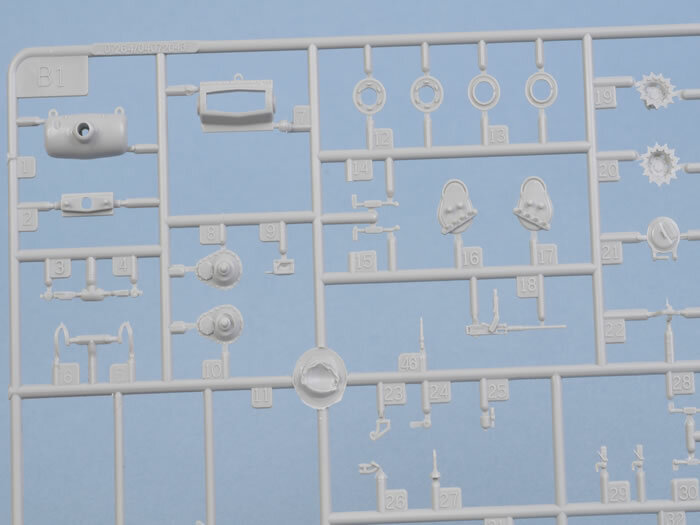 The Kit supplies both an M3 and M3A1 Barrels (as fitted to the later M26A1 and M46) which are single piece moulds and very well done with hollow muzzle brakes. 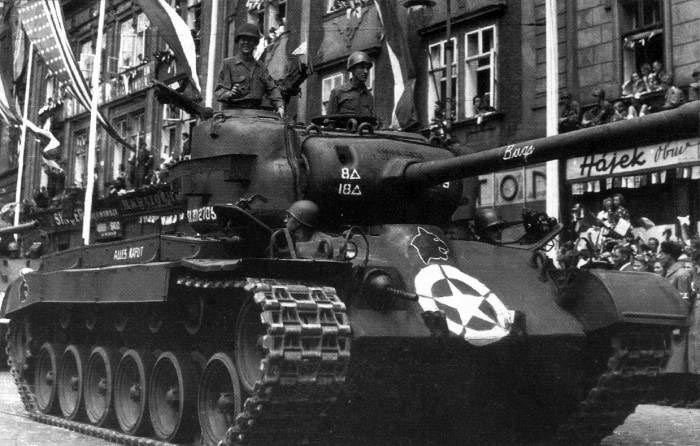 Option A is a 9th Army vehicle which was done up for a victory parade in Pilsen Czechoslovakia in Jun 1945 named “Alles Kaput” which fields black panther markings on the rear skirts and the glacis. The vehicle belongs to 8th AD, 18th TB, A Co., vehicle 9. Option B is a 2nd Armoured Armoured Division example but appears to be wrong. Trumpeter give you 2Δ-87Δ and E10 which represents 2nd AD, 87th Regt E Coy , 10th vehicle however the 2nd AD only had the following Armoured Regiments: 66th & 67th so there appears to an error with the 8 being included instead of the 6. Regardless, there are no instructions to show you correct placement of the markings for either example wit hthe Option B not showing you where any markings other than the star on the turret side go. In summary, this is a good kit of an important vehicle and as an old Wargamer one that would have been appreciated many years ago. It is well detailed with the reservations outlined above and despite the horrid image on the Box Top captures the look of the Early Pershing well.